6 inches of deep pumpkin knit, plus an inch of crimped upper crust. The leg portion of the sock is done. Now for the fun part. Last night I started the heel flaps—finish them both this morning, and the turning Even got the first of 4 sets of gussets picked up. The turning has a first time change—I am doing a reverse sole—Purl side out, and smooth stocking knit against my skin. I don't think it will make much difference—I never find the purl bumps uncomfortable—or so I think. Who knows, I might just notice the difference with a reversed sole. I'll work the first 2 stitches (the knit one, and the k2tog) of the gusset in knits, and the rest of the stitches in reverse stocking knit.. at least till the gusset is finished. 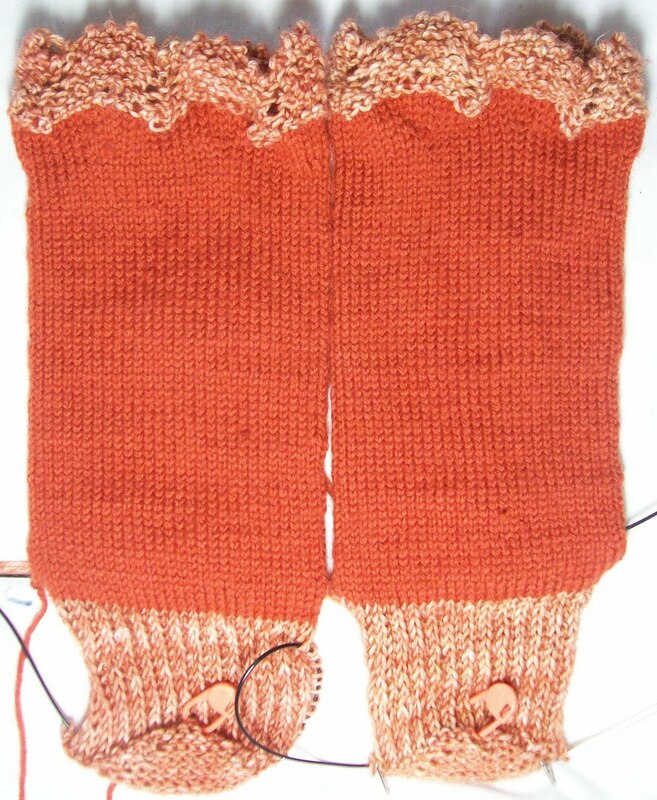 I think the joining of the upper and lower foot of the sock will be easier working knits to knits. And I think I am going to alternate between the sole and instep. Working a few round on the sole, and then turning the sock and working a few row (to catch up) on the instep. I'll see how that goes—if its too complicated, I won't continue—but I think it will work out fine. I might even alternated row by row, and interlock the yarns intarsia style as I go. EZ worked out one solution, I think I can work out my own.